Getting close to the ice walls, floating just an arms length past them, I could see each distinct strata, a history of the climate embedded in the ice. Drastic and dark undercuts, towering pinnacles, and electric blue ice arches stood on royal display as I floated by. Two of us, Nathaniel and I, were particularly keen to take some time to photograph the beauty before us. Getting lost in the moment of capturing this surreal landscape with our lenses we eventually floated up to the rest of the group. They were not particularly happy with us dilly-dallying around in this cold ice-ensconced world. Add to the cold of the ice wet neoprene, cold feet and fingers and the rest of the party was keen to keep moving in an effort to stay warm. Bobby, the trip organizer and the only one of us who had been down this river before, promised there would be more ice further down and that we would have more opportunities to take photos, but he had to keep the group moving and keep them warm. That there was more ice down stream might have been true when he was last here some 30 years ago, but it is no longer the case. Climate change has taken its toll on the Kongakut and the Arctic. Since 1977 the mean spring temperature has risen 4.2˚F in the Arctic . I had lost my chance. I couldn’t blame Bobby. Having done some guide-work myself I knew the safety of the group is always the number one priority and although I was willing to sacrifice my own comfort to “get the shot”, it was not worth putting the group at risk or discomfort. 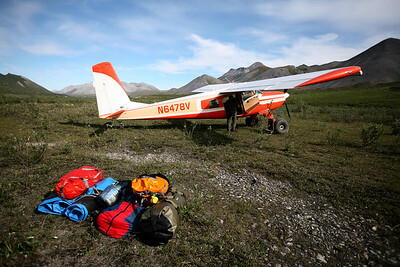 On our flight in, we wove our way through the green, brown and gray peeks of the Brooks Mountains aboard a Helio Courier airplane and spotted a herd of 2,000 caribou grazing on the tundra grass and resting on the remnant snow patches preparing for their next migratory push southward. We landed just a few miles down the valley on the level though somewhat overgrown flood plain. The next morning we hiked up the river valley with the hope to get a closer look at the aggregating herd. These caribou, a fraction of the Porcupine caribou herd (named for the Porcupine river area where the herd spends the winter, not for any resemblance to porcupines), are a core argument of the anti-drilling campaign. For humans especially, walking over the various forms of tundra is a challenge. The terrain constantly changes right under your feet. From the loose gravel of the riverbed to firm and rocky soil to swampy marsh where the permafrost prevents collected spring melt water from soaking in. Narrow grass tufts form unstable islands among the standing water where legs and ankles tire quickly trying to balance and negotiate the uneven wobbly terrain. Amazingly, only once did a footstep slip, soaking my boot. The flowers of the arctic were out in force. Purple, red, yellow, white and blue dots scattered sparsely amongst the tundra grass across the rolling ribbed slopes of minor drainages feeding the headwaters of the Kongakut. We removed our boots to cross the river to gain a prominent knob overlooking the caribou. My numbed feet tingled in my boots as they warmed again. The effort to get closer paid off. 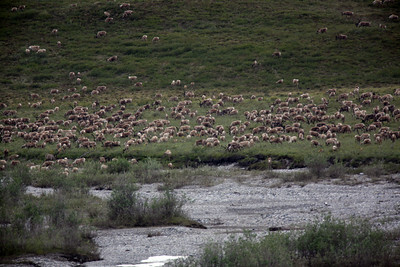 The caribou herd browsed on the hillside and in the river bed. Some of them were lying down on the snow patches in stark contrast to their dark bodies. In time, the whole mass of them would be on their feet to move back and forth hundreds of yards as the collective conscience of the herd became unsettled and tried to decide on continuing their southward migration or to graze here just a little longer in the benign weather. Just seeing the caribou made the whole trip worth while. Many of us had read Karsten Heuer’s “Being Caribou” – his account of following the Porcupine caribou herd on foot to document this 20,000 year-old tradition. These caribou have the longest migration of any land mammal on earth. They migrate 1,500 miles over four mountain ranges from the Porcupine River in Canada’s interior Yukon to the breezy, relatively bug-less Arctic National Wildlife Refuge costal plain in Alaska to give birth in the summer. Then they make the journey back south to their wintering grounds with their vulnerable young in tow. Along the way they encounter the dangers of hungry bears and wolves, carnivorous birds, swarms of biting flies, and human hunters. They ford raging rivers, navigate steep mountain passes, endure fierce storms and forage for food. The caribou are central in the diet of many native peoples including the Gwich’in who call the caribou calving grounds on the costal plain of the Arctic Ocean Vadzaih googii vi dehk’it gwanlii, which means “the sacred place where life begins.” Returning to camp, and seeing a rainbow along the way after a quick storm blew through, we knew our days ahead on the river would only continue to offer more and more to this Arctic experience. Once on the river things didn’t quite work out as planned. 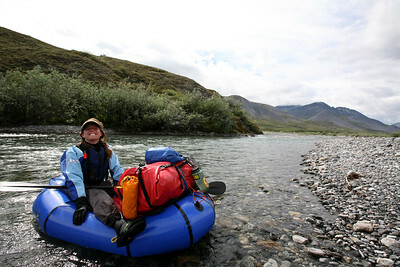 It was hard to find enough room on the small packraft to carry 18 days of food and gear to survive the Arctic summer. Packrafts are designed to be small and light enough to pack into the backcountry. All seven of us had to deal with unstable boats under mounds of supplies – even the two inflatable kayaks. Not 100 meters into the float one of the packrafts claimed the first flip caused in part by the other problem, exacerbated by the heavy boats, the shallow water. We were dropped off 10 miles up river from where the few commercial float trips on the Kongakut begin and we struggled to find enough water to float our boats. We all struggled with repeatedly getting out of our rafts to drag them through the shallow water over the smooth river stones until it floated again and then dared to remount our buoyant steed in hopes it would continue to float. Each time I succeeded, it was a joyous moment of relief until the next rock bar, sometimes only a few meters down river, brought me to a gentle halt and I was once again forced to climb out, take the painter and wobble my way over the loose and slippery river rocks dragging my lifeline of supplies behind me. Comparatively speaking, these minor concerns melted away as the river got faster and deeper. 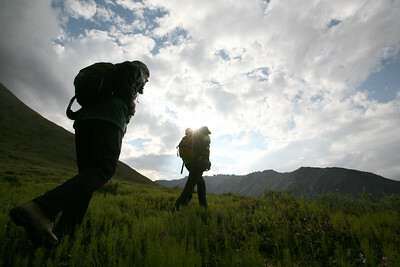 The alternative was to experience the Arctic National Wildlife Refuge by foot, carrying the 18 days of food on my back. I might as well let the river do most of the work. We didn’t have to bring all of our supplies thanks to the fish in the Kongakut. According to NOAA’s 2008 Arctic Report Card climate change will have little effect on the Kongakut fish in the foreseeable future. 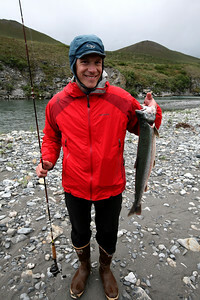 Both Bobby and Nathaniel only had to cast once or twice before they each pulled 5+ pound Arctic Char (Salvelinus alpinus) and smaller Arctic Greyling (Thymallus arcticus), both in the salmon family (Salmonidae), from the river. The Greyling is a beautiful sailfin fish. There was a time when the Grayling could be fished in Montana and Michigan, but overfishing has made it all but impossible to find them in the lower 48 while they are readily found throughout most of Alaska. The tender white meat of the Grayling fried up nicely in butter and cornmeal, but to my taste, it had nothing on the pink meat of the Arctic Char. The trout like Arctic Char is the northern most freshwater fish found in lakes, rivers and streams all around the circumpolar region. Lindsay, one of three women on our trip, had been living in Japan just prior to this arctic adventure and contributed a miso brine to baste the char in as we fried it over the open fire burning arctic driftwood. Char made it on the menu a number of nights on this trip and it was always a treat. Every bite of fresh fish was a blessing. We were far from news updates of the oil spill going on in the Gulf save what snippets Bobby got when he called his younger daughter in Colorado on the SAT phone for World Cup results. My hart went out to those fishermen who had to wait out the spill for employment and the families whose livelihood depended on the fishing industry while we fished and ate freely thousands of miles away and a world apart. Here in the arctic a spill would be equally devastating. Though less people would be affected (at the onset) – the char, grayling, caribou, polar bear and many species would suffer just like the animals in the Gulf. An oil spill like that of the Gulf breaking loose here could mean the end of the polar region, the ice cap and the global climate as we know it. Already with the aforementioned warming climate change trends arctic sea ice is disappearing and its continued disappearance is self-exasperated. This phenomenon, so aptly illustrated in Al Gore’s “An Inconvenient Truth”, shows how an absence of white ice to reflect the energy of the sun’s rays back to space is causing more dark blue water to be uncovered which absorbs that energy to warm the water and melt more white reflective ice. This process is warming the polar ecosystem. Each day was different on the river. Starting in the hart of the Brooks Mountains we floated the meanderings of the Kongakut river cutting through the peaks towering around us. In places we passed canyon walls hundreds of feet tall. The terrain then gave way to rolling tundra-covered hills. A final canyon gateway brought us to the upper costal plain. The large peaks slowly got smaller behind us. A series of foothills and the last big block of mountain, Caribou Ridge, diverted the river westward before we truly escaped the front range onto the north slope. A wide vast range of river deposited debris, talus and detritus that is the alluvial fan of the Kongakut surrounded us. The Brooks Range became more and more distant behind us, obscured by the mist raising from the patches of ice and snow. The mountains slowly faded from our thoughts as a new horizon, across the estuary, lagoon and a sand bar called Icy Reef, appeared before us. We emerged into a new and final chapter of our voyage – completely flat, blue, and distinctively polar: The Arctic Ocean. We saw a few grizzly bears on this trip. We set up an overnight watch so we wouldn’t be surprised by a bear ambling into camp and rummaging around while we slept. Interestingly, the first night was when the first bear was spotted. There was no threat to our camp. This confirmed bears were around and it was worth being vigilant. Bobby woke me for my watch in the early hours that morning asking “Hey, Cam. Want to see a bear?”. The sun was still behind the ridge to the northwest simulating night for us. On the grassy tundra slope in the shadow just across the river and only a half-mile away a blond grizzly bear was foraging for her food. It looked like she was hunting something moving as she would hop or pounce, look around, dig some and pounce again. She never gave any clue that she knew we were just down the slope on the gravel bar. 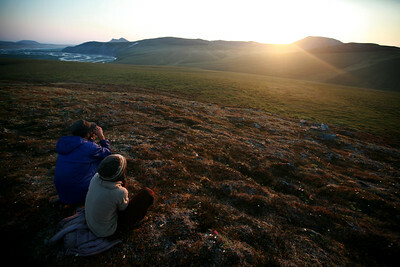 Bobby and I watched fascinated and as the sun peeked around the side of the ridge on a super slow rise moving eastward. Eventually, the bear, seemingly friendly from this distance, wandered across the slope and out of sight and our attention turned to the next display of wildlife activity: an Arctic Fox just down river trying to sneak up onto a birds nest to find some breakfast. The closest bear encounter happened while we were on the river. Towards the end of our trip, we were paralleling Caribou Ridge. We spotted a lone caribou working through the shallow braided channels of the Kongakut. The caribou made a nervous glance back away from us and that’s when we spotted a bear crouching low in the sparse river foliage only 70 meters from us. At that moment a number of things happened nearly simultaneously. We pulled ashore to stop drifting closer. The caribou bolted away from us. The bear looked at us and promptly shot up the 50-degree mixed scree and tundra slope of Caribou Ridge, away from the river, the caribou, and thankfully, us. We watched with awe. His back muscles rippled through his blond fir as he galloped up the slope. Initially strong and fast, both fore-paws reaching out together and pulling his massive body up. Then, as he began to tire he settled into a loping run and finally, 300 vertical meters later he reached the ridge. His body outlined by the bright blue sky behind him and as is typical of animals when they reach a ridge, he turned to look back at us briefly before disappearing over the top. While bears, wolves, arctic fox, 2,000 caribou, and more than 40 species of birds are very exciting to see, and deeply appreciated by the group, the one animal that excited us most was the wolverine. Even Nathaniel, our resident Alaskan, had never seen a wolverine in the wild before this and it checked a square off his top three Alaskan animals to see in the wild. The other two are walrus and polar bear, which proved elusive to our hopeful eyes this trip. 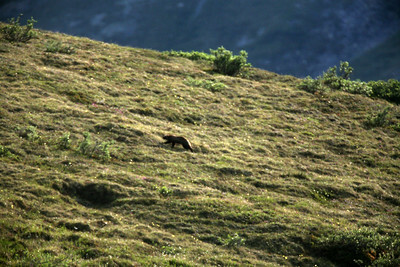 The wolverine sighting came as we were finishing a day-hike in the Brooks Range. Our exploring had taken us over the peak that hovered above our camp, down the backside and we connected with a dry streambed that wrapped around back to the Kongakut. Camp was just across the verdant alluvial fan between waterways when Jess, Bobby’s daughter, spotted movement down on the riverbed. Sudden gestures of excitement encouraged those trailing behind to step it up and hurry to where all could see what she saw. The wolverine, often mistaken as a large badger, having spotted us as well ran behind a huge rock, turned up stream and kept on going. We had pulled out the big lens (600mm/f4) to capture an image of him just before he slinked to the next drainage. We got a few distant fuzzy shots to prove it wasn’t just a dream. The Kongakut river, like most of the rivers of the North Slope, fans out to a million braided streams and we did our best to stick with the deepest channel with limited success. Like in the beginning we were going beyond the standard trip and we were getting out of our boats to drag them over the many shallow spots in the braided river. Most rafting trips end near Caribou Ridge where the water is still deep and fast. We pushed on to the ocean and had to work for it. I can’t imagine doing it any other way. Patches of snow scattered amongst the braided streams caused a layer of thick fog turning my companions into floating voices around me. It was unclear where we broke free from the river and entered Siku Lagoon. The current of the river slowly disappeared with the obscurity of the fog and we found ourselves paddling through no more than a foot of water. Escaping the fog and returning to clear sky, a gray strip across the horizon broke the baby blue of the sky from the green blue of the water. It grew more substantial with each stroke in the calm lagoon: Icy Reef. With childlike glee in anticipation of seeing the Arctic Ocean, we rammed our boats onto the silty shore, bounced out of our rafts and made a mad dash over the 2-meter berm of rounded pebbles and sand. The body of water on the far side was calm and a bank of sea ice just out of reach from Icy Reef stretched along the shore for as long as we could see. Beyond the 10 meters of pack ice, chunks of ice floated on their own and beyond that the calm open Arctic Ocean. If we were to walk across via the North Pole we’d end up in Norway. After staring out at the Arctic Ocean for a while we came back to our boats and froze in our tracks spotting a massive paw print. 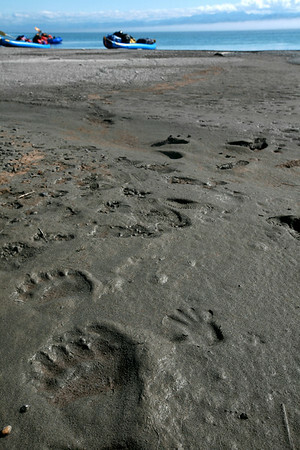 We are all familiar with griz tracks and this print dwarfed even the biggest of those tracks any of us had seen. Not to long ago, maybe a week, maybe days, maybe hours, a polar bear walked past here. Right here where we stood. Our jaws agape, our minds bewildered, excitement rising, suppressing fear we just stood there and stared much like we did at the ice laden Beauford Sea moments before. Each time we spotted animals or even just the evidence of wildlife we caught a glimpse of the difficult life they lead. Hunting, foraging, fighting and bracing against the elements and coping as best they can as the climate changes around them. For three days we enjoyed exploring Icy Reef. We paddled amongst the ice chunks in the Arctic Ocean, we created artistic designs in the rocks and sand, we competed in some friendly games like driftwood baseball, rock skipping, scrabble and more. It was that much needed vacation after a vacation. Time to read, write, relax and to reflect on the recent adventure and the Arctic alongside a crackling driftwood fire and with a cup of hot coco in hand. I don’t expect it to be beautiful to everyone, but it is to me. I don’t expect everybody, much less any sort of majority of the world, would want to visit here, but I’m glad I did. I even want to come back someday, even if there were a few mosquitoes. This entry is filed under: Air, Earth, North America, Photography, Raft, Story, Water. As an adventurer and a lover of extreme sports, I will never forget the experience I've had with white water rafting gatlinburg. Next stop will be arctic rafting. Thanks for a lively, fun and interesting presentation on this journey at REI in Anchorage recently. Loved the format. Looked like a great trip with good company and made me hungry to get out "there" now that the snow is melting! Thanks for coming! Glad you liked the format. I'm getting lots of positive feedback on that.